Did you know your toothbrush could be covered with almost ten million germs? We know … it’s gross! That’s why you should know how to store your toothbrush properly, and when it’s time to replace it. If you need to brush up on your toothbrush care knowledge, we’ve got you covered so brushing will always leave you feeling squeaky clean. Your mouth is home to hundreds of types of microorganisms, so it’s normal for some of them to hang onto your toothbrush after you’ve used it. Rinsing your brush thoroughly with water after each use can get rid of leftover toothpaste and food particles that cling to the bristles. Some dentists suggest soaking your toothbrush in mouthwash every now and then can help reduce the amount of bacteria further. Store your toothbrush in a cool, open environment away from the toilet or trash bin to avoid airborne germs. Closed containers should be avoided because they provide a warm, wet habitat that bacteria love to grow in. If you have multiple people sharing one sink, an upright holder with different sections will keep everyone’s brushes separated and avoid cross contamination. In addition, we would hope this is a no-brainer, but please don’t share toothbrushes! Microwaves and dishwashers are not suitable tools for cleaning a toothbrush, because brushes aren’t built to last through this kind of treatment. If you want a really clean toothbrush, your best option is simply to buy a new one. The American Dental Association recommends you replace your toothbrush every three to four months, or sooner depending on individual circumstances. Dr. Jeff Loveless and our team agree. If you have braces, tend to brush too strongly, or the bristles become frayed, it’s time for a new brush. 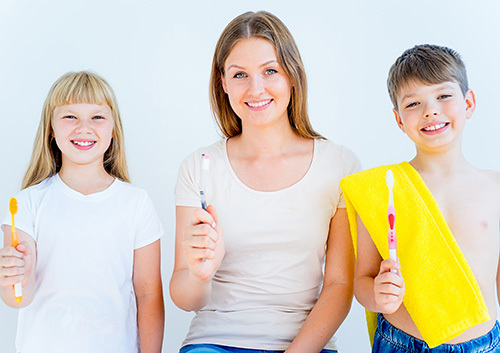 Children will also need replacement brushes more frequently than adults. If you or your child has been sick, you should replace the toothbrush immediately to avoid re-exposing yourself to illness. Worn-out brushes are not only unsanitary, they don’t do a good job cleaning teeth. Bristles that are worn out and dull won’t scrape away plaque and bacteria as well as a fresh toothbrush can. Though the idea of ten million germs can be worrisome, if you take a few small precautions, you may ensure your toothbrush stays in good shape. And the cleaner the toothbrush, the cleaner the smile!